Big cats and snowmen might be an unnatural union, but for groups of cats living at two separate wildlife centers, getting to know their snowy friends was a delicious experience. 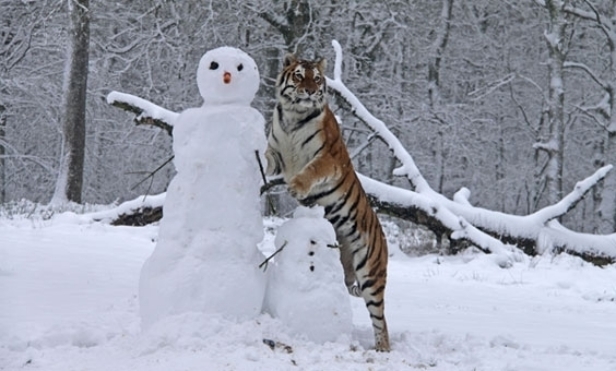 In the video, four Siberian Amur tigers at Longleat safari park in Wiltshire in the UK were filmed “introducing themselves” to a pair of snowmen. This wildlife center, which rescued a retired circus elephant named Annie last year, is designed to allow animals to move about in spacious environment that mimics their natural habitat. And while snow is unheard of on the African savanna, it appears that the tigers are not only comfortable in the snow, but have found a way to use their powerful attributes for a short lived wrestling match with the snowmen. Longleat isn’t the first to build snowmen for their residents. In fact, the Wild Cat Sanctuary in Sandstone, Minnesota hosted their own snowman extravaganza with hilarious results. Have a look as a variety of cat species say hello to Frosty. Responses to "Rescued Circus Tigers Meet Snowmen For The First Time At The Wild Cat Sanctuary"